When you are a gardener, you spend a lot of time outdoors. As peaceful and meditative as gardening can be, pests are an inevitable issue you must contend with in your yard. Fortunately, you can use your gardening skills to combat this problem by planting certain herbs in your garden. While including these insect-repelling plants is not going to make your garden entirely insect-free, they may help to reduce the insect population enough so that you can enjoy your garden fully. If they don’t, call the experts at Ray Pest Control in Piedmont. We will happily take care of any infestations on your property so you can get back to your favorite hobby. In the meantime, here are some herbs that have pest-repelling properties. If you are a fan of Italian food, you will love having basil in your garden. From pastas to salads to soups, there are many dishes that basil enhances. Not only that, you can make insect repellent from basil! Simply boil four ounces of water, pour it into a container of basil leaves, and allow it to steep for a few hours. Then, mix four ounces of vodka into the mixture. Store this spray in the refrigerator, and spray it on yourself before you leave the house. Lavender is not only a pleasantly scented plant that promotes relaxation and sound sleep, it is also a repellent to moths, flies, mosquitoes, and fleas. You can use lavender to make your home smell fragrant and keep it free of these pests with bouquets of lavender. Plant lavender in the sunny areas of your yard and near the entrances into your home in order to repel pests from these areas. Lavender oil is also an effective mosquito repellent you can use on your body. Lemongrass is a natural mosquito repellent because it contains citronella, which you are probably familiar with from the citronella candle you have so you can sit outside in the evenings. Lemongrass is not only a delicious way to flavor pork, chicken, and salads, it can be planted in a pot or in the ground. Try planting this fragrant herb near the entrances of your home to prevent mosquitoes from getting too close. Mint is a great addition to your garden if you want to repel mosquitoes. However, mint is a very aggressively growing plant, so it is wise to plant it in a pot rather than in the ground, where it can spread and take over everything. You can use your mint leaves to flavor water or tea, or add it to dishes with lamb or fish. Place pots of plants strategically in areas where mosquitoes are a particular concern. You may love seasoning your dishes with rosemary, but insects hate it. Rosemary repels a variety of pests that will try to feed on your vegetable plants, so it is wise to plant it in your garden next to your tomatoes and peppers. You can also grow it in containers and place it on your patio to repel mosquitoes. 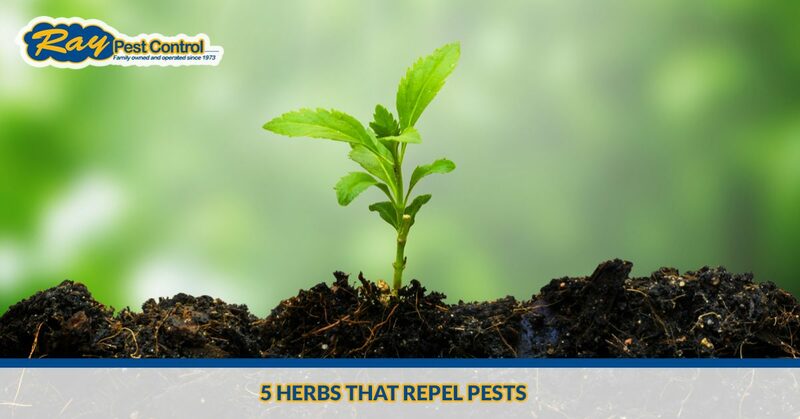 You can also make a natural mosquito repellent by playing dried rosemary in a quart of boiling water and straining it as you pour the mixture into a container of cool water. If, despite planting these herbs, pests are still infesting your yard, contact Ray Pest Control. We are the leading exterminators in the Winston-Salem area who can help you with your pest control needs. Call today!